This next DIY project was a surprising realization for me. I've always had a conflicting opinion of nautical décor. The thought of my house being filled with red life preservers, white wooden seagulls and navy blue furniture makes me cringe. Recently though, I've being seeing nautical décor in a new light. There really are so many things to love about it. I think the key to incorporating this style into your current décor is moderation. Experiment with small things. Try adding a few mason jars filled with sand, sea shells and votives to your current style. Group together a few milk bottles frosted in various shades of sea glass blue. Mix in a frame or two of printed starfish, coral or anchors. I found this simple square frame at my local craft store. To keep with the nautical theme I wanted to give the wood an ‘aged’ look. I found a great tutorial that uses only steel wool and vinegar. As you leave the undiluted stain on, it darkens the wood as if you had used a commercial wood stain. I used a straight undiluted vinegar and 0000 steel wool solution that had been left overnight for the vinegar and steel to react. I didn’t use the tea since I only had chamomile tea on hand and I believe you are supposed to use black tea. I also believe she leaves the mixture for a week. I only left mine overnight but still had nice results. Remember that different types of wood will turn different colors. I don’t know what kind of wood my frame was made of. I believe it was poplar. Anyway, I really wanted a more ‘gray’ patina look so I ended up making a white wash with diluted white paint and water. Then, after I distressed the wood, I made a black wash. I made sure to get this in the cracks and crevices of the split, cut and distressed areas. The bottom photo shows brown rust colored stains. (I’m not sure if it’s actually considered rust but I assume that’s basically what I did - I created and accelerated rust mixture.) yep, those dark stains are nothing but white vinegar and steel wool. Pretty cool right. Just be careful of the surface you're working on because as the name implies, it really does stain. Distressing the wood is the really fun part. The one tip I have is to be careful you don’t go overboard. What you want to do is get a hammer, chisel, and some sand paper. You basically want to duplicate a woods natural aging process in nature. Use the hammer to bang a few dents randomly around the wood. Use the chisel to dig into the grain of the wood and slightly split it. You want to focus on going in the same direction as the grain of the wood. Next I decide to try ‘aging’ the rope I was going to use on the frame. To my surprise it worked very well. The vinegar mixture quickly turned the jute and nice gray color. *Jute is a cord made from natural plant fibre as is hemp and flax(linen). Jute Plants or Corchorus plants are relatively easy to grow compared to other plants used for fabric, such as cotton. This keeps jute very inexpensive. I suspect the organic quality of jute is what makes it react so well with the vinegar mixture. 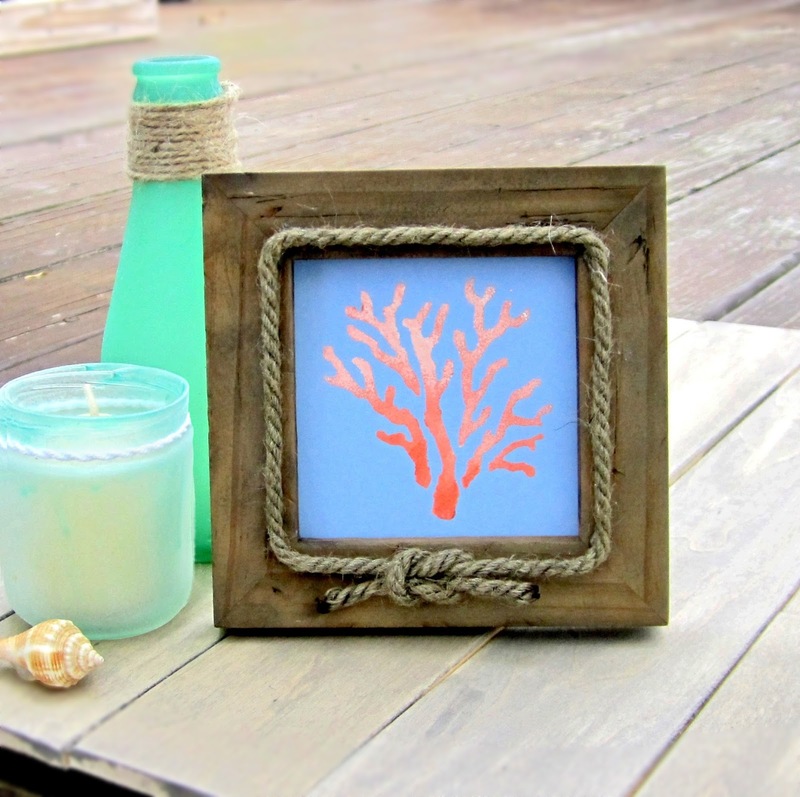 To finish the nautical look I wanted to frame the frame with the jute tied in a square knot. Not only is this knot (I know that’s the second word play, I promise no more) the only one I know, it’s simple to tie. Here’s a great tutorial….. To keep the frayed ends of the jute from unraveling I singed the ends. You could also use a bit of hot glue or Elmer's glue. I couldn't decide what to put in the frame once it was finished. 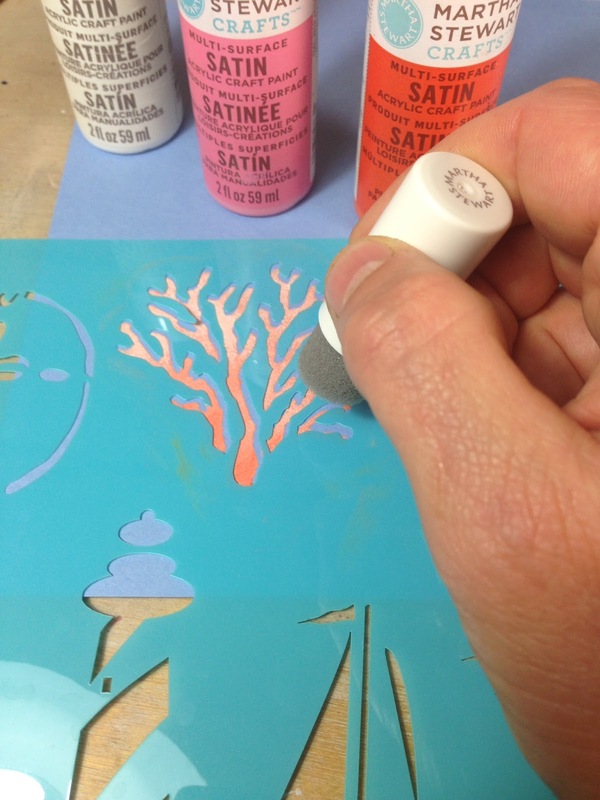 Instead of using a photo, I simply stenciled coral from MS Crafts Nautical stencils onto a piece of card stock. The ombre coral fits nicely into my modern nautical theme. Next we’re going to magically turn the bottles into frosted beach glass. One of my favorite products to accomplish this is from Martha Stewart Crafts. It’s glass paint that comes in a variety of finishes. One color in particular that I love is actually called Beach Glass. You’re going to be amazed at how these bottles turn out. The look and texture is that of glass that has been etched but with color. There are two products I’ve discovered that are a great for paint application. They basically turn any paint into ‘spray paint’. this gives a professional, brushstroke-less finish. One product is made by Martha Stewart Crafts and is available as a glass paint system or regular craft paint system(there is really no difference). The other product which costs CONSIDERABLY LESS is made by Preval and is nearly identical. The only difference I call see is that the MSC system comes with a medium to thin the paint. With the other system you basically use water to thin the paint. I suppose you lose some of the paints integrity(ie: adhesion and pigmentation) by thinning it with water. In my case everything turned out perfectly. I suppose it’s because the MS paint is such a high quality paint to begin with. 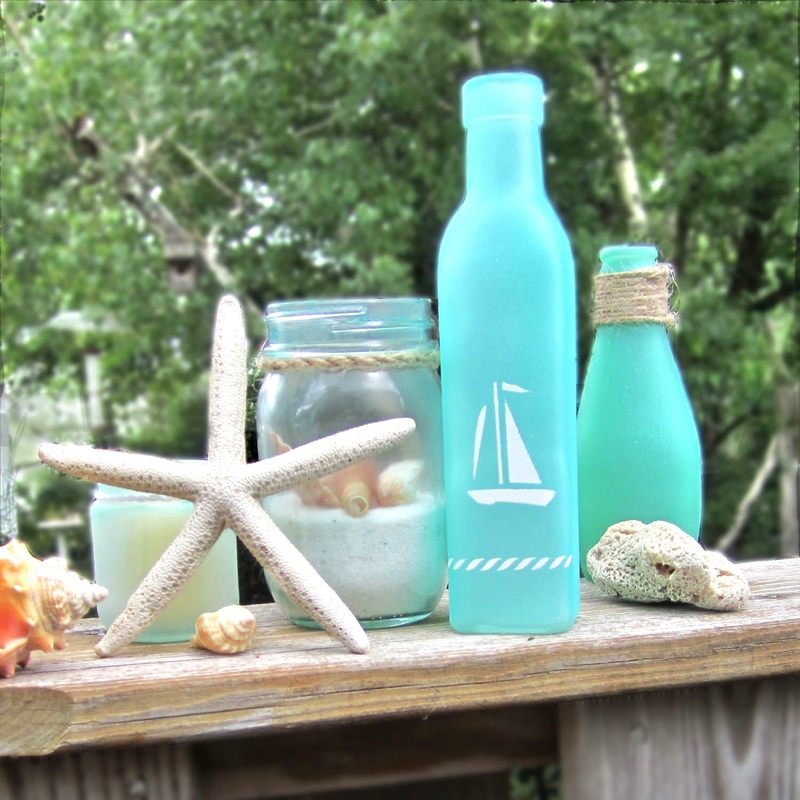 I added a little nautical detail to one of the bottles with a set of stencils from MS Crafts. I also added lots of jute wrapped around the tops of bottles. I happened to find some old shells, beach glass and a starfish I must have saved from a million years ago(See, hoarding does pay off!). To finish everything I grabbed a little white sand from the craft store and filled some mason jars with sand, glass, shells and candles. 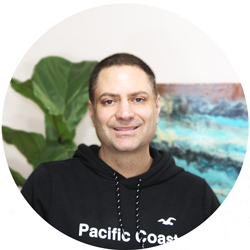 if your interested in beach or nautical style but don’t know where to start. you can incorporate these beach styled themes throughout your home. I would love if you would share your own projects or links.